Most Soft Bait molds require the use of an injector (item code: 61-91345). The injector is used to inject the heated liquid plastisol into the mold.Open Pour molds do not require the use of an injector. 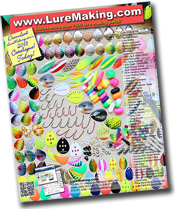 LureMaking.com stocks the most popular CNC SoftBait molds and lami plates. Gary Yamamoto Senko Molds 3", 3.5", 4" & 6"
LureMaking.com can special order any of the more than 300 CNC Machined SoftBaits Molds. All of the CNC molds, lami plates, cutters listed below are special order. Every two weeks we receive a new shipment of special order CNC-Machined molds. 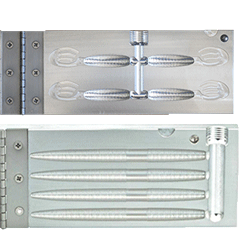 Depending on the day your order is placed your special order mold will take between one and two weeks to arrive here as we receive shipments from the manufacturer every two weeks. Sale of any special order CNC machined softbait molds is final. All prices are in Canadian Dollars. 3.5" Swim Toad "Big Foot"
4" Swim Toad "Big Foot"
4.5" Swim Toad "Big Foot"